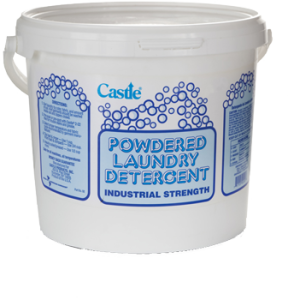 Castle® industrial strength powdered laundry detergent is a professional formula designed to provide outstanding cleaning action against oily and greasy soils without degrading colored fabric. It is fortified with brightening agents for radiant results. Once the bond is broken between soil and fabric, special agents go to work preventing resettlement of dirt on fabric. 1.Launder by color, fabric and amount of soil. Knit garments should be washed inside out and zippers closed. 2. Presoak or pre-spot with Castle® 2-22™ for trouble stains and grease. 3. Select proper temperature and fabric cycle recommended by garment manufacturer. 4. 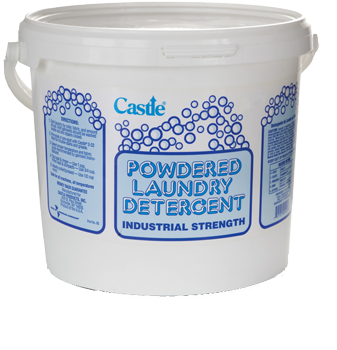 Top load and ringer washers use 1 cup powder.